Monitor riser places monitor at a comfortable viewing height. Adjustable riser enables you to customize your viewing level. Height adjusts up to 2-1/2" with a total range of 4" to 6-1/2" above worksurface. Stow laptop underneath for extra desktop space. Storage tray organizes business essentials for easy access. Nonskid rubber feet protect worksurface. 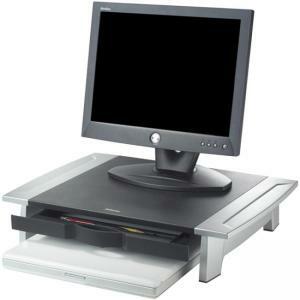 Monitor riser supports 21" monitors up to 80 lb.